Sitting here in Kaleb's nursery rocking him I look around his room and think about how many people have contributed to his room. How incredibly loved he is. I look at the decals I searched for and then put up with the help of his daddy. 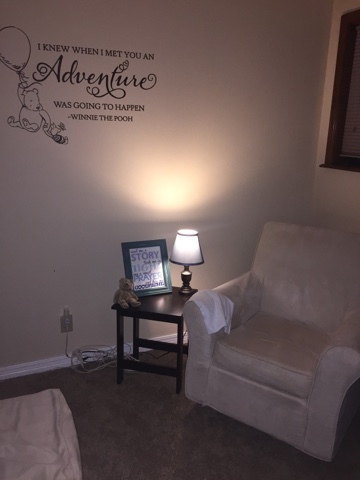 The chair I am sitting in given to us by Heather who sometime soon I will trust to oversee his care during the day. The little bear on the nightstand that Haley helped me pick out for him before we left the NICU. On the bookshelf sits the Curious George from Nana. I also see the Panda bear from Rance, Jessica, and Heath. Baskets purchased while shopping with Courtney. Even the cart that his Grammy and Gramps found so that we could put all of his medical equipment on so that we could wheel it around the house. 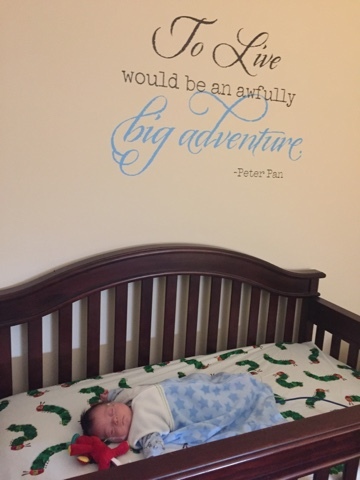 Everything in his room all the way down to the baseboards and doors finished by Daddy and Dalton were a work of love as we prepared the room for our little K2. The NICU family print that will soon be on the wall above his dresser, signed by the many wonderful people that looked after our precious boy. I love that his room holds all of these symbols of love. Thank you for loving this boy with us. He is a pretty special boy who makes it impossible not to fall in love with him. We are all in love with him. For fourteen weeks I looked around trying to picture having a new baby here at the house. 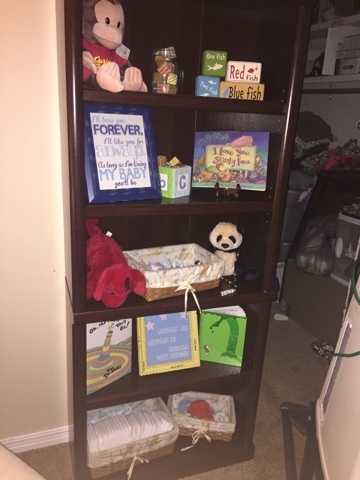 It was frustrating to look around the house and not see the evidence that there was a new member of the family, besides the mess due to all the time spent at the NICU. Now everywhere I look I see the signs of Kaleb. It is very evident there is a baby in the house. It is also evident by the lack of sleep and the pee and spit up I have sported thanks to my youngest son. Who also got a talking to from my oldest who stated that it was a no no to pee on Momma and he needs to learn to use the potty. While I am exhausted as we work to establish a new routine I can't help but feel content. This feels right. No longer is our family split. No longer do I feel torn between my boys knowing which ever one I am with that I am an hour away from the other. Last night was the first night that after getting up to pump during the night that I didn't find myself about to call the NICU which had been the nightly routine. We have made it. We have reached that time that we have dreamed of since getting that positive pregnancy test, since this all started at the end of August, and since we began the NICU journey. We are a family of four and we are home.